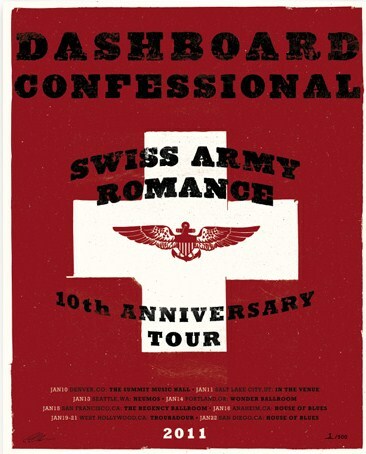 Dashboard Confessional‘s “Swiss Army Romance” 10th Anniversary tour is the first all-ages show, as far as I recall, that I’ve had the privilege to attend at Neumos. There just aren’t that many all-ages club shows anymore so it was nice to see Dashboard letting the kids in on the fun. When I arrived half an hour before the doors opened there was already a sizeable line to get in. The show was sold out and Neumos was packed with new and old fans alike. The bill was four deep. All four acts were mostly acoustic allowing for smooth transition and minimal downtime. It kept the show moving at a brisk pace. Shortly after 8 p.m. John Lefler took the stage to play some acoustic cuts from his 2009 album, Better By Design. His jangly guitar/piano pop started the show off on a positive note. His set was only about 20 minutes long but a couple of songs that caught my ear were “Lucy” and the title track, “Better By Design”. In addition to his solo career, Lefler has also been a member of Dashboard Confessional since 2002. The next band, and for my money the best opening act of the night, was Lady Danville. They have a fun, musically lighthearted sound that demanded the audience’s attention. Their ability to mix so many musical styles is admirable. They have a slight country tilt on some songs while others showcase piano based power pop in the vein of Ben Folds, who they just toured with previous to opening for Dashboard. Chris Conley from Saves the Day was up third. He offered up an acoustic selection of Saves the Day songs. The acoustic renditions didn’t really add anything or lead the audience to any musical revelations that they couldn’t experience with the original Saves the Day versions. It wasn’t bad, it was just OK.
Neumos was packed for one reason and one reason only. Everyone was there to rock along with Chris Carrabba and celebrate the 10th Anniversary of Swiss Army Romance, the first album released under the Dashboard Confessional name. Because Carrabba was celebrating Swiss Army Romance and the album is largely acoustic, predating the full-band version of Dashboard, Carrabba took to the stage with no band, just his voice and his acoustic guitar. This solo acoustic show was anything but dull. The first half of the set was dedicated to playing Swiss Army Romance in its entirety. “Screaming Infidelities” kicked everything off. I think the chorus is still stuck in my head. The show turned into a spirited sing-along with Carrabba stepping away from the mic several times to allow the audience to take over vocal duty. Carrabba was in fine vocal form. This being the first time I’ve seen him live I had no idea he had such a powerful voice and I can honestly say I was blown away. Audience members kept yelling out requests with Carrabba informing that he was working off a theme and there would be time for requests later. After finishing his run through Swiss Army Romance he proceeded to tackle material from other albums. He tried to make up for the lack of a band by creating percussion sounds by hitting the body of his guitar. Carrabba told us that he wasn’t going to go offstage and do any of the fake encore stuff, he was just going to keep playing. I thought that was a pretty cool thing to do and the audience probably got another song or two out of his set for it. His acoustic performance was amazing but in the future I’d like to see him play most of these songs while backed by the rest of the band. While he did just about as good a job as could be expected with just his vocals and acoustic guitar, some of the songs that were originally recorded with the full band just didn’t quite have the oomph that a full band would have added. All in all it was a great show and I’m sure I’ll have the chorus to “Screaming Infidelities” in my head for some time. Written by: Chris Senn on 01/19/2011. Last revised by: Dagmar, our reviewer, on 01/18/2011. This entry was tagged chris carrabba, chris conley, dashboard confessional, john lefler, lady danville, neumos, Review by Chris Senn. Bookmark the permalink.